Are you getting your recommended 5 servings a day of fruits and vegetables? The National Cancer Institute’s nutritional guidelines state that everyman, woman and child should consume a minimum of 5 servings of fruits and vegetables a day. Fruits and vegetables contain powerful health-promoting and immune-enhancing antioxidants and other plant substances our bodies need daily. Forever Living knows that our good intentions of eating a balanced diet are not always met. 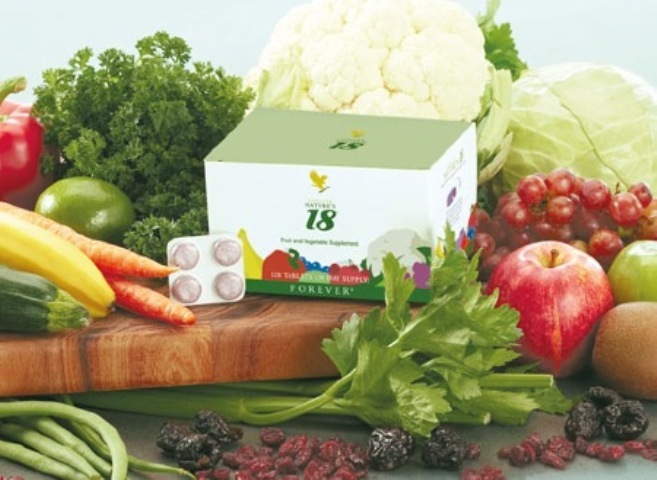 We want to make sure that you and your family meet these minimum requirements, so we have created Forever Nature’s 18® – a proprietary blend of fruits and vegetables that are the heavyweights, so to speak, when it comes to supporting your health. Just 4 tablets give you the antioxidant equivalent of eating 5 servings of fruits and vegetables a day: Grape, Apple, Blueberry, Elderberry, Cranberry, Raspberry, and Grape Seed Extract all support the immune system with their antioxidant plant substances. Rutin, which is found in Oranges, Grapefruit, Lemons and Limes, has been shown to support healthy joint function and circulation, and Bananas are known for their ability to support healthy blood pressure levels. Carrots, Cabbage, Cauliflower, Celery and Green Beans are all noted for their ability to promote good health through the elimination of free radicals in the body. And Kiwi, Prunes, Red Bell Pepper, Zucchini and Parsley all provide Vitamin C as well as promoting good digestion and eye health. Forever Nature’s 18® is a pleasant-tasting, easy-to chew tablet that delivers your daily requirement of antioxidants from fruits and vegetables. A daily serving of Forever Nature’s 18® is your way of supporting your body with the fruits and vegetables it needs to maintain your health. Forever Nature’s18® is Forever Living’s way of assuring you that no matter what your day throws at you, the antioxidant benefits of 5 servings of fruits and vegetables are conveniently at your disposal! Chewable, great tasting tablet – ideal for the entire family! We all know that our bodies function best when they receive all of the vitamins and minerals they need. Our skin, in particular, demands antioxidants and essential fatty acids to combat the effects of toxins in the environment. Take the 30-day challenge: Can you eat the following five foods every day for a month? And don’t forget – Forever Living offers a wonderful line of Sonya Skin Care products. In fact, if Sonya didn’t leave this in your stocking, pick up a Sonya Skin Care Kit today and enjoy the rejuvenating and moisturizing effects of this perfect five-step beauty treatment. These tasty, full-of-fiber fruits contain polyphenols, specifically anthocyanins, which give the fruit its blue hue, and the major contributors to antioxidant activity. If you can only eat one fruit, eat blueberries. And they’re just as good fresh as thy are frozen. Speaking of fat-soluble antioxidants, sunflower seeds are a source of vitamin E, which travels throughout the body neutralizing free radicals. Eat more sunflower seeds to enjoy the anti-inflammatory effects of this important antioxidant. Avocados include 20 essential nutrients, including folic acid, potassium, vitamin E and the essential B-vitamins. Plus they taste delicious on everything from salads to sandwiches to tacos to enchiladas. They also aid digestion of fat-soluble nutrients and they are source of healthy fats. Did you know that researchers have found over 45 flavonoids in kale? Say goodbye to oxidative stress by adding kale to your morning smoothie or piling a kale salad high with yummy colorful veggies. The carotenoids in carrots are an amazing source of vitamin A. Eat them on your Kale salad with blueberries, avocado and sunflower seeds, and you will win your 30-day challenge without fail!